The Hawaiian Serenaders performed a Mother’s Day Concert at Kula Hospital on Maui. The next concert will be Father’s Day. “You made my day. I’m coming early to your Father’s Day Concert so I can sit up front,” commented a Kula Hospital resident after our Mother’s Day Concert from 10 a.m. – 11 a.m. on Sunday, May 13. The woman talked to us at length about how happy she was to listen to our music (and we had noticed her singing along during the concert). We were told to expect up to 75 people at our concert outdoors. My husband and I performed as the duo, The Hawaiian Serenaders, on ‘ukulele, u-bass, and vocals to upbeat, fun, sing-along songs that were familiar to the senior audience. We heard comments that they liked the variety of songs in different languages (Filipino, Japanese, Hispanic, and Hawaiian) that are popular in Hawaii. One lady commented on how much my personality came through and how much she enjoyed our music. We started our set 10-minutes early and sang a couple of songs by memory after we ran out of the planned songs for the one-hour set. We will return to Kula Hospital to present a Father’s Day Concert from 10 a.m. – 11 a.m. on Sunday, June 17. Our show set will include four songs that a nurse requested we play the next time to accompany her hula dancing. 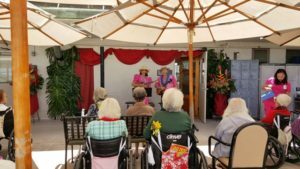 The first time we performed at the Kula Hospital was in October 2010 when we brought members of our Maui Ukulele Pops Band comprised of my ukulele students from Kaunoa Senior Center for adults 55 and better. We were pleased that the same Activities Coordinator still works at the hospital and remembered us! Visit our Hawaiian Serenaders webpage for audio samples and more.